You can watch a tutorial video, or read on for complete details. Note: These features are only available in the set list view. 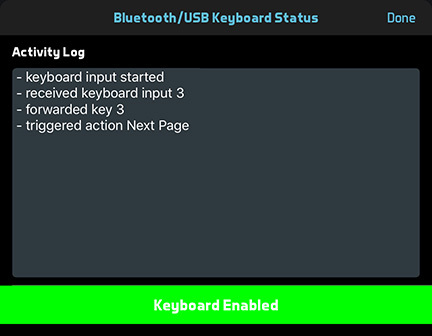 Note: The Bluetooth devices mentioned here work like an external keyboard that you would type on, but with a small number of "keys." The buttons on a foot switch typically mimic the arrow keys on a keyboard. Find out what keyboard messages your device can send. For example, the Airturn Duo sends up/down messages from the first two footswitches, and can send left/right messages from a second pair of switches. 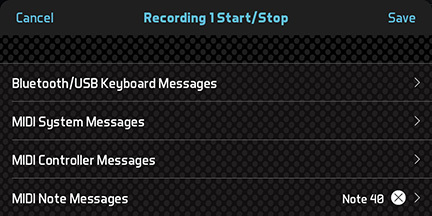 The iRig BlueTurn sends up/down messages with the default settings. The Coda Stomp sends left/right or up/down messages depending on the position of the Mode button. Open the Settings app on your iOS or Android device, navigate to the Bluetooth page, and pair your Bluetooth device. Some AirTurn devices have an AirDirect mode with additional capabilities. If you have an AirDirect-compatible AirTurn and want to use it in this mode, do not pair the AirTurn with your iOS device, and use the Settings app to "forget" the AirTurn if you have previously paired it there. Instead, open BandHelper, navigate to Settings > Remote Control, tap Set Up AirDirect AirTurn, turn on Enable AirDirect AirTurn, and then select your AirTurn from the list when it appears. 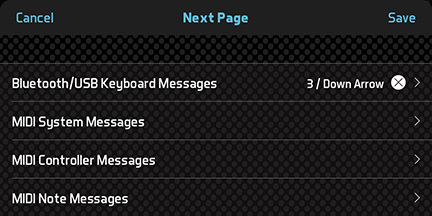 By default, an AirTurn in AirDirect mode will send messages 1 and 3 to BandHelper. If you want to use multiple AirTurns, you can select each AirTurn from the Set Up AirDirect AirTurn button, then define the messages (0-9) that you want the two buttons on each AirTurn to send. You can then use up to five AirTurns at once, sending a total of ten different messages. Navigate to Settings > Remote Control > Actions and find an action that you want to trigger. Tap that action, then tap Foot Switch (Keyboard) Messages and select the keyboard message you want to trigger it with. For example, to select the next page of your lyrics when you send a down arrow message, tap Next Page and select Down Arrow. To turn on Bluetooth keyboard input, tap the "foot switch" button in the top toolbar . If this button is not visible, you can show it by selecting Settings > Appearance > Top Toolbar Buttons > Bluetooth/USB Keyboard Messages. This button opens a status window. If the button at the bottom of the window says Keyboard Disabled, tap it to turn on keyboard input. You can also view incoming keyboard messages in this window, to test your connection. Navigate to a set list or a smart list. Use your Bluetooth device to send messages to BandHelper. BandHelper will respond with the actions you configured. BandHelper will only receive Bluetooth messages while it is the foreground app, unless you are using an AirTurn in AirDirect mode, which also works in the background. Find out whether your MIDI device can send Start/Stop messages, Song Select messages, Controller messages or Note messages. For example, the Alesis PercPad can send note messages, and the iRig BlueBoard can send General Purpose Button messages. Navigate to Settings > Remote Control > MIDI Input Channel and select the channel on which your controlling device will send messages. If you do not set a channel here, BandHelper will listen on all channels. Scroll down to the Actions section and find an action that you want to trigger. Tap that action, then tap MIDI System Messages, MIDI Controller Messages or MIDI Note Messages and select the MIDI message you want to trigger it with. For example, to play the current song's recording by sending note 40, tap Recording Start/Stop and select note 40. The MIDI icon in the top toolbar should turn on to indicate that the app is ready to receive MIDI input: . If this button is not visible, you can show it by selecting Settings > Appearance > Top Toolbar Buttons > MIDI. Clicking this button opens the MIDI Status window. You can view connected ports and incoming MIDI messages in this window to test your connection. Use your MIDI device to send messages to BandHelper. BandHelper will respond with the actions you configured. BandHelper on iOS, by default, will only receive MIDI messages while it is the foreground app, but you can turn on Settings > Audio & MIDI > MIDI Options > Receive MIDI In Background to change this. This setting will only take effect if you exit the app while viewing a set list. Since an app running in the background uses more power than an app that is allowed to go to sleep normally, you should be careful to navigate out of a set list before exiting the app when you are finished using the app. 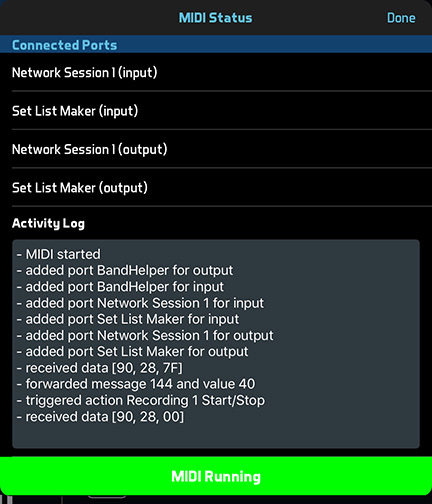 On Android, BandHelper will generally receive MIDI messages in the background, but this is not guaranteed and it depends on the memory usage of the other running apps. Most remote control actions aren't tied to specific songs, but you can map MIDI messages to specific songs. Then if you have a MIDI device that makes it easy to send arbitrary messages, you can use these messages to navigate directly to the desired songs. Find out whether your MIDI device can send Song Select messages or Program Change messages. Song Select messages were designed for exactly this purpose, but are limited to 128 songs, and are less commonly used. Navigate to Repertoire > Songs and click a song title to edit it. You'll see either a MIDI Song Number field or a MIDI Program Change field, with accompanying Bank MSB and LSB fields. Enter unique values between 0 and 127 into these fields. Program your MIDI device to send the values you entered for each song. Navigate to a set list or smart list that contains the songs you want to select. Then send the messages you programmed from your MIDI device. Alternatively, you can use a Song Select or Program Change message to select songs by their position in the set list view, using the Song Number In Set List action on the Settings > Remote Control page. For example, you could send song number 4 to select the 5th song in the list (MIDI messages are numbered from 0), song number 10 to select the 11th song, etc. Navigate to Settings > Device Linking > Remote Control. Turn on the Song Selection option to follow song selection messages; the Song Addition option to add any songs to a show that the master device added with the in the show view; or the Page Position option to follow page selection and zoom messages. Link your devices for remote control as described on the Linking Devices page. Select songs or position pages on the other linked device. BandHelper will perform the same actions on your device.